Are poor eating habits affecting your staff’s productivity levels? Does your business have a regular intake of graduates and trainees who could benefit from expert nutrition advice as part of their induction programme? Is your business going through a turbulent period resulting in an anxious workforce? 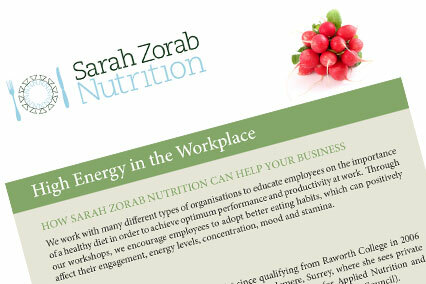 We work with organisations of all sizes, and in all industries, to provide expert and practical nutrition advice. Our one-hour workshop can form part of your employee wellness strategy, or act as a standalone talk or team-building activity. The basis of the talk focuses on how a balanced and nutritious diet can improve staff performance and productivity including engagement, energy levels, mood and stamina. We also work closely with businesses that have a regular intake of graduates or trainees, such as lawyers and accountants. Our workshop can form part of the induction programme. It looks particularly at making the transition from student to worker, and how optimum nutrition contributes to robust mental and physical health. Our corporate workshops start from £250. If you would like to discuss how we can help your business, please contact us for more information at sarah@sarahzorab.co.uk, or read the testimonials below.